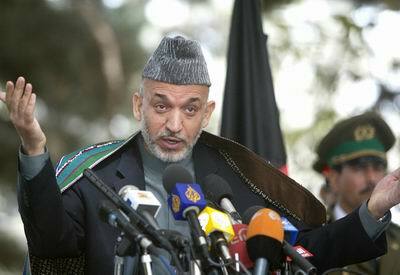 Now, returning from his trip to New Delhi where he secured Afghanistan’s membership into SAARC, president Karzai has joined the fray. BBC Persian reporter Marzia Adeel reports that while the press conference was nominally held to mark the president’s trip to India and the regional summit, most of the journalists peppered him with questions about the new political front that has decidedly postured itself at odds with Karzai’s policies. Responding to questions about the new front, the president was quick to accuse it of enjoying the backing of Afghanistan’s neighbors through their respective embassies in Kabul. While the president did not name any names or offer any evidence to back his claims (save for saying that Afghanistan’s Ministry of Foreign Affairs and the National Security Directorate were investigating possible links), his comments are sure to bring the new group under scrutiny and perhaps even cost them politically. And for good reason: certain faces among the UNF’s leadership have well-established, time-tested, and undeniable links to regional stakeholders such as Iran, Pakistan, India, the Russian Federation, and some of the CIS nations. The president also used some ‘spin’ in attacking one of UNF’s stated goals to instate gubernatorial elections for Afghanistan’s provinces, saying that such an arrangement would be tantamount to federalism (he did not explain how), and that that was not a route that the people of Afghanistan wanted to go down again (he did not say when they had done so before.) In regard to UNF’s other goal of changing the constitution in favor of a parliamentary system in Afghanistan, the president invoked the mandate of the people (an oft-invoked genie these days) in that their representatives voted in the constitutional Loyal Jirga in favor of a strong unitary and presidential form of government. Furthermore the president choose the occasion to admit that members of his government have met with Taliban representatives and that he has had personal audiences with them. This is most certainly in response to another point on the UNF agenda, i.e. its stated willingness to negotiate with the Taliban. With the Taliban’s cycle of spring insurgency well underway and suicide bombings taking place at unprecedented frequency and proximity to the capital, UNF’s placatory moves could be seen as a more attractive alternative to the Karzai government’s failure to negotiate with the Taliban to curb violence. So far so good. The president has done well in choosing to confront the reality of the new front and responding to their stated goals and criticisms of the government instead of ignoring it like he has been doing for the past couple of weeks. The cynical wheeler-dealers that constitute the new front bring to mind other such disastrous mass marriages of convenience during Afghanistan’s lost decade (1990s) i.e. the Islamabad and Mecca pacts. Then too leaders and figures who were sworn enemies of each other had come together by the force of circumstances and united by their common designs on the people of Afghanistan. Now, marginalized and confronted by new realities (read the frightening episode of “National Amnesty” debate where for a while it seemed likely that the bill would not go through and they would remain prone to accountability for their deeds) some of the very same figures have come together again. Lastly, the new group is aggressively promoting itself as a multi-ethnic and broadly representative grouping. In reality, this could be vacuous posturing as the UNF is not all that representative. While the formation of new political parties is widely recognized as one of the most urgent needs of the political system in Afghanistan, the truth is that groups like UNF simply don’t cut it. Instead of such old-guard, top-down, wheeler-dealer line-ups, genuine efforts by civil society groups in Afghanistan should be encouraged. This entry was posted on Friday, April 6th, 2007 at 6:42 pm and is filed under Foreign Affairs, Neighbors, Political Parties, Politics. You can follow any responses to this entry through the RSS 2.0 feed. You can leave a response, or trackback from your own site. Seems like it is impossible to understand Who is Who and Who is What. A puppet criticizing other puppets, alright if they are masterminded by foreign embassies, what about you Mr. President? What about your puppet administration? What about your whole existence? Isn’t foreign backing the only factor that legitimizes your presidency? The Pot calling the Kettle black. Sorry Mr. President, not good enough. You are no better than those who you criticize, have never been, are not and will probably never be coz hypocrites never quit hypocrisy.